At the time, America’s rural communities were connected by a network of itinerant peddlers, or “hucksters,” who sold household goods. The peddlers were often associated with dishonest dealings (part of the definition of a “huckster” today), and the original “wooden nutmeg” was a euphemism for a general mistrust of such people. Thomas Hamilton, a British traveler who toured America and documented his findings in Men and Manners of America in 1833, said of peddlers in New England: “They warrant broken watches to be the best time-keepers in the world; sell pinchbeck trinkets for gold; and have always a large assortment of wooden nutmegs and stagnant barometers.” In The Clockmaker: Or, The Sayings and Doings of Samuel Slick, of Slickville, published in 1839, the main character is called “a Yankee pedlar, a cheatin vagabond, a wooden nutmeg” by an incensed rival. But were wooden nutmegs real, or a myth used to villainize merchants? In appearance, weight, and texture, nutmegs are very similar to wood. Curious about the practicalities of carving one, I commissioned an artist to make me a wooden nutmeg to see if the time and craftsmanship involved were worth the monetary gain and risk of getting caught. He produced a convincing nutmeg in 30 minutes, which would have been especially realistic if it had been lightly colored with a natural stain. The artist estimated it would have taken him an hour if he eliminated the use of a bandsaw and belt sander for the earliest steps in shaping the nutmeg, and relied only on hand tools available in the 19th century. Although it's difficult to estimate early-19th-century work weeks and salaries with precision, a laborer in the early 19th century might have made about $.08 an hour (based on an average daily salary of about $1 and a 12-hour workday) [PDF]. I’ve estimated that a nutmeg would sell for about the same amount as that hourly wage, based on references I’ve found to British prices at the same time and American prices later in the century. That means the labor may have been worth it. However, as a consumer it would have been easy to foil a fake nutmeg vendor: A purchaser could take a small nutmeg grater with them and grate a little of the nutmeg before buying. Either the grated nutmeg would release its signature spicy smell, or the wood would be largely odorless—a clear sign of a fake. But perhaps if the fake nutmegs were mixed in with real ones (as one early reference to the story suggests), the scheme could work—especially if the seller wouldn’t be passing that way again. Although all the wooden nutmeg stories refer to the peddlers as simply “Yankees,” it was in this era that Connecticut unofficially took on the moniker of the Nutmeg State. According to an 1859 source, the nickname was adopted because of the stories that wooden nutmegs “are manufactured there.” It Happened in Connecticut author Diana McCain posits the nickname was adopted much like Yankee Doodle—transformed from an insult into a proud rallying cry. Soon after the Civil War, stories of wooden nutmegs passed into history and legend. In 1801, the British invaded and temporarily gained control of the Banda Islands. 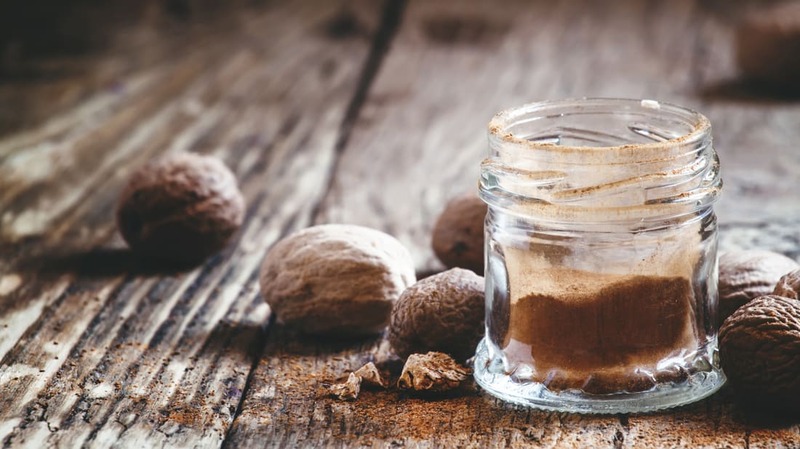 One of their first actions was to remove nutmeg trees and transplant them to other British colonies, including Grenada in the Caribbean—where much of the world’s nutmeg comes from today. Nutmeg prices dropped dramatically by the middle of the 19th century, and dominated the flavors of American food in the 1840s to 1860s. According to the Oxford Encyclopedia of Food and Drink in America, 17 mechanical nutmeg graters were patented between 1854 and 1868, an example of nutmeg’s immense popularity and availability. Now that nutmegs were cheap and plentiful, the era of the wooden nutmeg was over—if it had ever existed at all. An edition of the magazine The Ladies Repository published in 1865 tells one more version of the origin of the story: A fool from South Carolina bought real nutmegs, and upon trying to crack them with a nutcracker, found there was no meat inside. He then accused the seller of selling him fake nuts made from wood. In this case, the magazine framed the narrative as a Northerner versus a Southerner, but the story feels like one that predates Civil War politics, retold and reframed many times. Perhaps all the cautionary tales, insults, and rivalries were spawned not by actual wooden nutmeg trickery, but simply by an oft-repeated joke. Today, saffron, vanilla, and cardamom are the most expensive spices on the planet—not nutmeg. Because such spices are often hard to grow and labor-intensive to harvest, it’s not uncommon for them to be replaced by cheaper alternatives, like safflower for saffron and artificially produced vanillin for vanilla. Some spices might also be adulterated with cheaper ingredients—oregano can be bulked up with sumac leaves—while others are dyed to improve their appearance. Both methods increase profit margins. But in the 21st century, it’s rare to find the outright brazen fraud of the wooden nutmeg.